(Nanowerk Spotlight) The challenge in treating most brain disorders is overcoming the difficulty of delivering therapeutic agents to specific regions of the brain by crossing the blood-brain barrier (BBB). This barrier – a tight seal of endothelial cells that lines the blood vessels in the brain – is a physiological checkpoint that selectively allows the entry of certain molecules from blood circulation into the brain. The problem for scientists is that the BBB does not differentiate what it keeps out. BBB strictly limits transport into the brain through both physical (tight junctions) and metabolic (enzymes) barriers. With very few exceptions, only nonionic and low molecular weight molecules soluble in fat clear the BBB. For instance, alcohol, caffeine, nicotine and antidepressants meet these criteria. However, large molecules needed to deliver drugs do not. Thus, while the BBB naturally evolved in order to protect the brain from invasion of various circulating toxins and other harmful molecules, it also serves as a major impediment towards the brain-specific delivery of various diagnostic/therapeutic molecules needed for combating various neuronal disorders. To date, delivery of therapeutic molecules into the brain often involves highly invasive techniques (like drilling a hole in the skull). The utter scarcity of techniques for brain-specific delivery of therapeutic molecules using non-invasive approaches has led researchers to increasingly explore the vast potential of nanotechnology toward the diagnosis and treatment of diseases/disorders incurable with present techniques. Scientists have now reported a nanoparticle-based platform which 'tricks' the BBB into allowing the entry of the nanoparticle into the brain, using an approach that draws parallel to the 'trojan horse' concept. Certain proteins and peptides, such as the iron-transporting protein transferrin, are allowed free access across the intact BBB as they function as carriers of essential nutrients into the brain. By linking transferrin with rod-shaped semiconductor nanocrystals (quantum rods) – an up and coming diagnostic agent which can also multitask as carriers of therapeutic molecules – it was found that the transferrin helps the linked quantum rods to 'sneak' across the BBB into the brain. This finding can have significant potential implications towards the development of brain-directed nanoparticle based diagnostic and therapeutic agents using minimally invasive procedures. 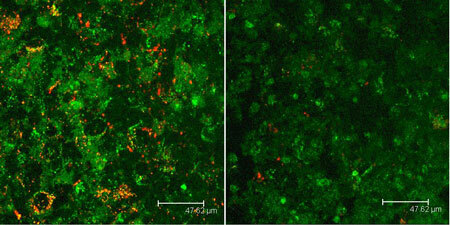 "Our work demonstrates a nanoparticle-based platform that will not only allow a direct visualization of the transmigration ability of various kinds of biomolecules across the BBB, but also facilitate the development of novel diagnostic and therapeutic nanoprobes for early diagnosis and therapy of various disorders of the brain, following systemic administration," Dr. Paras N. Prasad tells Nanowerk. "Quantum rods, owing to their high surface area, can be co-incorporated with other diagnostic and therapeutic molecules for targeted therapy of disorders of the central nervous system." Prasad, Distinguished Professor of Chemistry, Samuel P. Capen Chair of Chemistry, and Director of the Institute for Lasers, Photonics, and Biophotonics (ILPB) at the University at Buffalo, together with a team of collaborators from ILPB, the Department of Medicine at Buffalo General Hospital, and the Institute of Optoelectronics at Shenzhen University in China, have published their findings in a paper in the May 13, 2008 online edition of Bioconjugate Chemistry ("Bioconjugated Quantum Rods as Targeted Probes for Efficient Transmigration Across an in Vitro Blood-Brain Barrier"). "We have also demonstrated that the successful BBB transport of quantum rods conjugated to more than one protein can be monitored simultaneously, by exploiting the fact that quantum rods emit in different colors upon a small change in their size" says Dr. Indrajit Roy, a Deputy Director of Biophotonics for the ILPB. "This type of 'multiplexed' imaging will potentially help in monitoring the efficiency of BBB transport of a number of biomolecules, which is expected to significantly expedite drug-discovery programs investigating various BBB transporter molecules." "More importantly, we have discovered that the carefully functionalized quantum rods possess very low toxicity" says Dr. Ken-Tye Yong, Postdoctoral Research Associate in the ILPB. "This strongly suggests that quantum rods linked to drugs may be used as efficient therapy probes for treating brain diseases." This new study is an extension of previous work by the group, where they have already shown that quantum rod/quantum dot bioconjugates can serve as targeted optical probes for two-photon fluorescence imaging of cancer cells ("Quantum Rod Bioconjugates as Targeted Probes for Confocal and Two-Photon Fluorescence Imaging of Cancer Cells"). The scientists explain that their research has implications in two directions: one towards the development of a nanoparticle-based 'theranostic' system for neuronal imaging which can also function as a delivery vehicle for therapeutic molecules; and the other towards the fabrication of a model system across which the BBB crossing efficiency of a number of potential BBB transporter molecules can be competitively evaluated. Regarding the first case, while the active transport of liposomal and polymeric nanoparticulate formulations across the intact BBB has already been demonstrated by other research groups, Prasad points out that his team's findings unfold a new dimension in BBB transport using inorganic nanoparticles which are structurally robust and demonstrate the potential to transport multiple agents across the BBB. "These multiple agents can be selected so that they function in a synergistic way in the brain – e.g. the efficiency of a therapeutic molecule can be monitored non-invasively in real-time using a co-incorporated diagnostic probe." The second example is a first-time demonstration of its kind and is expected to significantly expedite drug-discovery programs investigating various BBB transporter molecules using a simple assay. Co-delivery of diagnostic and therapeutic agents against brain-specific diseases/disorders/social concerns such as brain tumor, neuro-AIDS, obesity, drug addiction, etc. Enhanced understanding of the BBB, elucidation of mechanisms governing its structure, composition, and structural changes in response to various natural BBB transporters, undesirable toxins, infective viruses including HIV-1, and potential BBB disrupting molecules. Studying the efficiency and kinetics of BBB crossing of various BBB transporting molecules such as growth factors, insulin, transferrin, etc. Development of a test-kit that would competitively evaluate the efficiency of a number of such molecules in a multiplexed, ?high-throughput? manner. "All these potential applications are also future directions for our work," says Prasad, but he cautions that particular challenges include development of a multimodal nanosystem carrying multiple diagnostic/therapeutic/targeting molecules, and the translation of this technique into clinical trials.